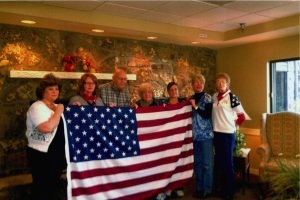 Flag Presentation…Old Glory was retired at IRV. Americanism Chairman, Debra Lutz, presented the new flag to IRV Executive Director, Donna Brock and Assisted Living Administrator, Nancy Deckard. Also present was resident, Augie Bode, Ladies Aux members, Carolyn Cook, Patsy Weidanz, Chris Lang and Marge Wright.